There are different things that are important for you is you are looking for portable table saw reviews vs. table saw reviews. There are a lot of things to consider prior to buying a portable table saw. With a little knowledge you will be able to buy the exact portable table saw to meet your exact needs. One of the most important things to consider in your new portable table saw is its power. Every job site or worksite table saw we have found uses the most common 120VAC. But that is only part of the story. There are some pretty significant differences between the actual power output of the portable saws motors. Don’t be misled by only looking at the amperage, i.e. : 15 amps. Did you know that a manufacturer could manufacturer a motor that is extremely inefficient and it would draw more current than a more efficient motor? While we are discussing motor amperage here it should be mentioned that if you need an extension cord to run your portable table saw, be sure to use an extension cord that is rated for the amperage you need. Using an extension cord that is too small (gauge wise) can result in the portable table saw motor overheating. Heat is the most common cause of motor failures so a little extra money spent on the right gauge extension cord might just save you a lot of money down the road. So bottom line is that the total current draw does not necessarily translate into the most powerful portable table saw for the money. You should look a little deeper into things like motor speed (RPM). All manufacturers state their motor speed for all the portable table saws. It is sometimes referred to as the arbor speed. Keep in mind that the rating shown are under ‘no load’ conditions so you cannot expect the same speed while actually making cuts. But is does give you a pretty good comparison as the table saws actual power. Some portable table saws have electronic circuits to help maintain the blade at a constant speed while making the cut. Unless you are ripping some pretty tough stuff, you really shouldn’t worry too much about buying a saw with that circuitry. If it has it, great, if it doesn’t then I wouldn’t let that be my deciding factor. 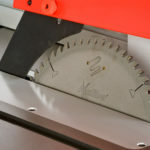 It makes sense that the faster the table saw blade is spinning, the faster you will be able to feed the cut. Also, the faster the blade spins means that under the same conditions, it will probably spin faster under load too. There is a correlation to the no load speed that manufacturers put in their specifications and do not show any ‘under load’ speed. It would be impossible to come up the exactly what ‘under load’ means anyway. Obviously weight is a consideration when buying a portable table saw. It has to be light enough to be easily set up and transported. From experience I don’t think that the weight is the most important factor. After all you only set the saw up one time per day on most days and if you buy a portable table saw with a stand then moving it around your jobsite is not that big of a deal. On the other hand, if you constantly are having to move the saw from jobsite to jobsite, then the weight might be more important to you. Keep in mind that if the saw comes with the stand, the weight shown is for BOTH the saw and the stand. Otherwise the weight shown is just for the saw. The lightest portable table saw is the Bosch GTS1031 at 52 pounds but that does not include a stand. The heaviest is the Bosch 4100-09 with stand. It comes in at 99 pounds but the stand accounts for 39 pounds of the weight leaving the saw itself to weigh 60 pounds which is in line with other saws (without stands). No matter what type of work you do, carpentry, cabinetry or trim work, you will, at some point be forced to use the maximum rip capacity of your saw. Rough construction is less likely to need a really wide rip capacity and cabinetry and trim work will have that need more frequently. The widest rip capacity (right of the blade) is in the Bosch 4100-09 at 25″ and the portable table saw with the smallest rip capacity is the Dewalt DW744 at only 16″. The maximum rip capacity for most portable table saws is a result of the amount of table top to the right of the saw blade. The larger the table saw table top, the wider the maximum rip capacity. It’s kind of misleading to read that a table saw can rip full sheets of plywood or sheet stock only to read a little further and see that the maximum rip width is 24″. Keep that in mind when comparing portable table saws. Overall the maximum rip capacity can vary widely from model and brad to another. If you frequently need to rip really wide stock, then you should take a look at the Bosch 4100-09 with its 25″ capacity. That is the widest we have found for portable table saws. It’s odd that not all portable table saws include a stand. Some, like the Bosch GTS1031 are sold without the stand. In our experience, if you buy the saw and the stand at the same time, it will save you some money vs. buying the saw and the stand separately. If you need to be able to move the saw around the worksite then a stand with large, oversized pneumatic tires will work best. Hard rubber tires can get caught on small pieces of debris so if you are buying a portable table saw complete with the stand then we recommend a stand with large pneumatic tires. One nice feature is a stand that uses a spring or shock to assist in raising the portable table saw into position. Some stands are designed to set the stand up and then set the table saw on top of it. Others are designed for the table saw to remain attached to the stand and then have a ‘gravity rise’ feature to make setting the saw up to height easier.